Dr. David Patrick, Director of the School of Population and Public Health at University of British Columbia, Canada, wants to help “alternatively diagnosed” chronic Lyme patients. So he and his colleagues studied the issue. The scientists found that all 13 chronic Lyme patients they looked at had no good evidence of having Lyme disease. They noticed striking similarities between chronic Lyme patients and Chronic Fatigue Syndrome patients. Many people have persistent physical complaints, such as dizziness or pain, that don’t appear to be symptoms of a medical condition. They are sometimes known as “medically unexplained symptoms” when they last for more than a few weeks, but doctors can’t find a problem with the body that may be the cause. This doesn’t mean the symptoms are faked or “all in the head” – they’re real and can affect your ability to function properly. Anxiety about possible late manifestations of Lyme disease has made Lyme disease a “diagnosis of exclusion” in many endemic areas. Persistence of mild to moderate symptoms after adequate therapy and misdiagnosis of fibromyalgia and fatigue may incorrectly suggest persistence of infection, leading to further antibiotic therapy. Attention to patient anxiety and increased awareness of these musculoskeletal problems after therapy should decrease unnecessary therapy of previously treated Lyme disease. 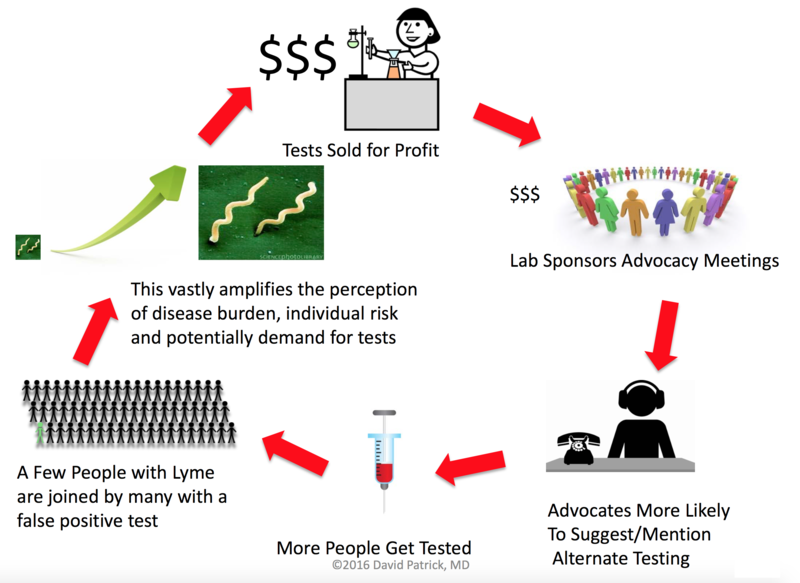 However, an important unanswered question of the study is whether the alternatively diagnosed chronic Lyme syndrome patients changed their beliefs about whether they had LD or not? The fact is there has been insufficient progress over more than 3 decades in understanding what is as much a psychosocial and cultural phenomenon as a biological one. Dr. Patrick also appeared on Global News (see video above) and presented a useful illustration of how chronic Lyme can spread socially. Other ways chronic Lyme spreads is via quacks and credulous media coverage. Lyme disease: How reliable are serologic results? Dr. Alan Barbour: “Lyme”: Chronic Fatigue Syndrome by Another Name? Dr. Harriet Hall: Does Everybody Have Chronic Lyme Disease? Does Anyone?